Through most of our adolescence and early adulthood, we are taught that human diversity — be it gender, nationality, skill set, or even food preferences — is a quality to be embraced. While this is true in our day-to-day lives, from a business perspective, treating everyone as an individual is very impractical, if not impossible (but we're working on it)! This is the impetus for market segmentation. While we cannot easily serve our customers on an individual level just yet, we can do the next best thing — uncover the similarities and differences between subsets of them, package them into neat little groups, and serve the needs of those groups. This can at least give our customers a sense that we are speaking to them as an individual even if 100,000 of our other customers received, say, the same coupon in their email. How do we segment our market? Typically, one of the first approaches is by K-means clustering. (For the sake of brevity, I'll assume the reader has an understanding of how K-means works. If not, check out this introduction to K-means clustering.) K-means is one of, if not the only, data clustering technique taught in statistics classes, so it only makes sense that business analysts would jump to it if a project necessitated market segmentation. K-means is, after all, fairly easy to understand under the hood and very efficient with large data sets you might see in a big data solution environment. But like all statistical methods, K-means clustering has some underlying assumptions. The data set on the left seems to clearly exhibit three well-defined, spherical clusters while the set on the right is a little more... nebulous. Is it two clusters? Maybe three? While a scatter plot allows us to inspect our data for obvious clusters, K-means does not see like we do and will adhere to the algorithm. Interesting results, to say the least. While the performance on the "neat" data set achieves excellent clustering, our "messy" data set — while not that bad — is suboptimal. Visually, we can see two, maybe three, clusters — but K-means creates partitions that don't particularly reflect that. Our clusters are of varying shapes and variances, which proves challenging for K-means to work with. Let's take a step back: What makes data "spherical," anyway? Our "neat" clusters are composed of data points that are normally distributed and isotropic (i.e., the same variance in all directions) across the two dimensions of the plot. Our "messy" data is normally distributed as well, but not isotropic (it's "anisotropic" for you real geeks). Furthermore, the "messy" clusters aren't well separated, so K-means has a hard time judging which centroid each data point is closest to. Now, while both data sets are artificially made, which one do you think you'd more likely see in reality? We need a way of clustering messier data! A classic example of how real-life data can exhibit a normal (Gaussian) distribution with non-uniform variance is height by gender. Both men and women have approximately normally distributed heights, but their means and variances differ. Gaussian mixture models, or GMMs, work differently than K-means in that they allow for directional variation (although still assume approximate normality) and are a "soft clustering" method. Based on the above plot, we can see that 69.2 inches has a higher probability of coming from the male height distribution (because we "peeked" in our previous plot), but there is also a probability that it could be a woman's height. We cheated a bit too because we created the distributions then fit a data point. In our example, we said we'd be given a data set of just heights, so the parameters that created these men/women height distributions would be unknown to us a priori. Expectation: Generate a number of distributions with reasonable parameters (mean and variance) based on the given data, then "ask" every data point how likely is it to fall within each. As with K-means, you need to specify the number of clusters — or in this case, we call them "components" — a priori. Maximization: Iterate and update our distribution parameters to maximize the data points' likelihood of being assigned to the most probable cluster. Pros: GMM allows data to vary anisotropically and provides probability estimates of cluster membership rather than "hard labeling" data points like K-means. Cons: GMM still assumes normal distributions across dimensions and requires the number of components/clusters are specified a priori. If you were to develop a customer segmentation model for your retail business, there is little doubt your clusters would contain a varying number of customers. The real world is never that kind to analysts! In our above example with GMMs, the toy data was generated with n ~ 1,667 in each cluster (or, 5000/3). What would happen if cluster membership was imbalanced? On the left side is the raw data generated, so n = 500 for both the turquoise and brown clusters and n = 25 for the blue cluster — clearly unbalanced. If we try to cluster our data points using K-means again under the assumption that there are three clusters, we see what happens in the right plot. Not pretty! Since the K-means algorithm is trying to minimize the sum or squared differences within each cluster, our centroids are naturally "pulled" towards larger, denser clusters. If the number of clusters is not known a priori, we can estimate it using the silhouette score to determine the best number. This brings up yet another consideration: What if some data points don't belong in any cluster? What if they are outliers or noise? Both K-means and GMMs include every data point in a cluster no matter how far away it is from the nearest centroid. DBSCAN does not require the analyst to select the number of clusters a priori — the algorithm determines this based on the parameters it's given. It excels at clustering non-spherical data. It does not force every data point into a cluster — if a data point lies outside of the specified starting parameters, it will be classified as "noise" and not included in any resulting cluster. Epsilon, or "eps,": A measure of radial distance extending from a data point. A larger epsilon means a larger distance from a data point is considered when determining if another data point should be considered in its "neighborhood" and vice versa. 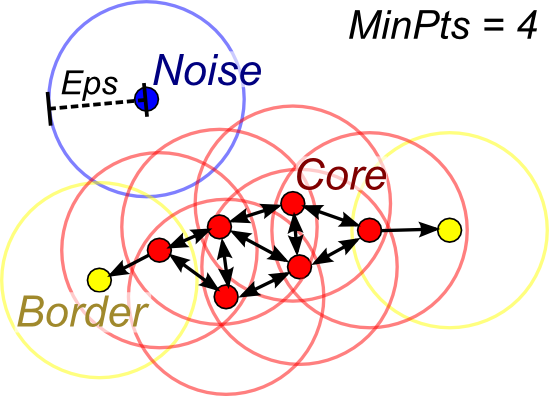 Minimum points: The number of other data points within a data point's "neighborhood" for it to be considered a "core" data point. The image above shows how DBSCAN parameters work. The circles from each data point represent the epsilon distance. For a data point to be considered "core" and therefore "clusterable," it needs to have the minimum number of data points fall within its epsilon radius (in this example, that number is four including the data point itself). "Border" points are also in the core clusters and form their edges. The blue data point has neither the minimum number of data points in its neighborhood nor does it fall within a core data point's neighborhood and is thus labeled as "noise." A major drawback with DBSCAN is that it's sensitive to the epsilon and minimum points parameters you give it. I can attest to this — while writing this article, I tinkered with parameters that differed only marginally but went from finding clusters to finding all noise on the same data set. The difference between setting "eps" at four vs. five could completely stop DBSCAN from working appropriately. An evolved version of DBSCAN, called "HDBSCAN" (the H for "hierarchical"), attempts to allow for clusters of differing variances and densities. HDBSCAN really only requires us to provide one parameter: minimum cluster size. Think of it like hierarchical/agglomerative clustering (that other clustering method you may have been taught in stats class): Every data point starts as part of its own cluster and iteratively clusters with the next nearest data points until all data points are clustered together. The minimum cluster size parameter allows us to toss out clusters below this threshold. It's more intuitive from a business standpoint to determine what size a cluster/segment needs to be in order for it to be considered "actionable" (i.e., you aren't going to create a targeted marketing campaign for five customers but you might for 50,000). The image above shows the minimum cluster size parameter from two to 20. You can see with smaller cluster sizes that nearly every data point is considered in its own cluster. Not very helpful. Yet, as we enlarge this number, we begin to see something more useful. Around a minimum cluster size of nine, two distinct clusters begin to form. Gradually increasing this value, we see that clusters get smaller with more and more data points labeled as noise (the darker blue colored ones). Pros: Does not require the number of clusters to be set a priori and allows for noisy data. Cons: Relies on the density of data points so sparse data sets may not work well and may lose efficiency on higher dimensional data sets. K-means is still a very useful algorithm for clustering. In no way am I attempting to get you, the reader, to toss it aside! However, every analyst can benefit from a more robust set of tools at their disposal. Happy clustering. John Sukup is the founder and principal consultant at Expected X, a company that brings sanity to businesses by making them feel secure with data solutions. John helps businesses add structure to ambiguity through data engineering, modeling, and execution — and, most importantly, by deriving value they can use to grow. John resides on the beautiful Big Island of Hawaii.